Waste pumps enable the installer to locate shower trays at floor level even where there is not a sufficient fall for the waste to be connected to the soil pipe. The diagrams below explain the basic requirements for the installation of a waste pump. Both the electric shower and mixer showers need to be fitted in conjunction with flowswitches on the supply pipes. An Electric Shower would need just one flowswitch as it only has a single supply but a mixer shower would require a flowswitch fitted to both hot and cold supplies. If further advice is required then please call our Technical Advisors on 01626 332210. The diagram below gives the basic outlines of a waste pump fitted in conjunction with a Mixer Shower. 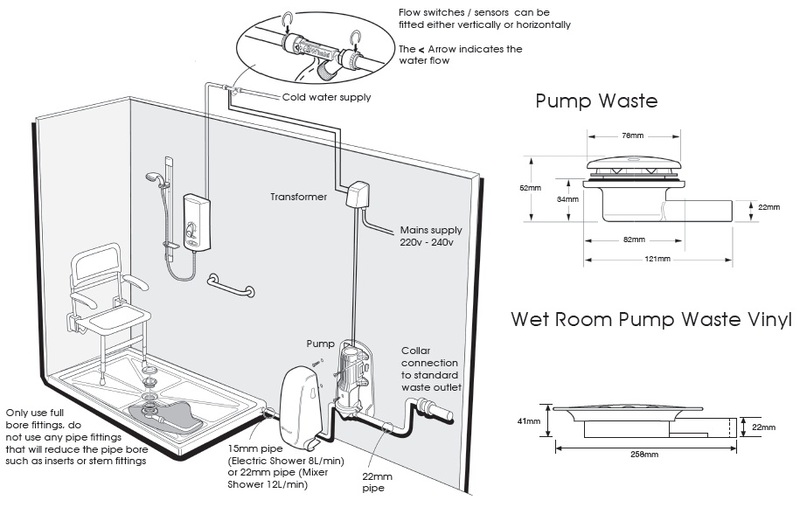 The diagram below gives the basic outlines of a waste pump fitted in conjunction with a Electric Shower.